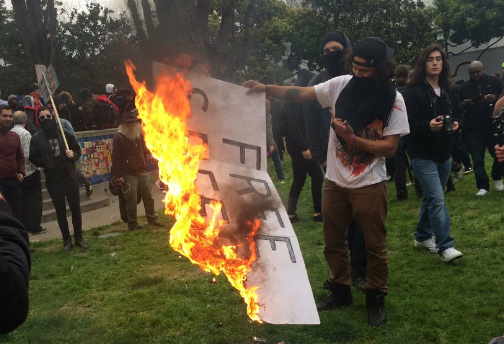 "Anti-faccist" burning a conservative's Free Speech sign at UC Berkeley, March 2017. (by Katie Mettler, The Washington Post) OREGON – For 10 years, the 82nd Avenue of Roses Business Association has kicked off the city of Portland’s annual Rose Festival with a family-friendly Rose parade meant to attract crowds to its diverse neighborhood. Set to march in the parade’s 67th spot this year was the Multnomah County Republican Party, a fact that so outraged two self-described antifascist groups in the [heavily Democratic] Oregon city that they pledged to protest and disrupt the April 29 event. [Rich Jarvis, a spokesperson for the Rose Festival Foundation, says organizers could not legally un-invite the MCRP to the parade because they were already approved. He added that Venture Portland canceled the event out of an abundance of caution, considering the potential safety impacts to all attendees at the parade. The free speech uproar in Portland reflects controversies across the country, particularly on college campuses, where speakers with conservative…ideologies have been met with occasionally violent protests or threats of protests. Appearances [on university campuses] by former Breitbart writer Milo Yiannopoulos, [libertarian author and political scientist Charles Murray] and, most recently, conservative commentator Ann Coulter have all been disrupted or canceled [due to protests, despite the fact that student groups had invited the speakers and wanted to hear what they had to say]. James Buchal, chairman of the Multnomah County Republican Party, said in a statement that his group wants the parade to continue. Reprinted here for educational purposes only. May not be reproduced on other websites without permission from The Washington Post. Visit the website at washingtonpost .com. 1. Portland, Oregon’s annual Rose Festival has taken place for over 100 years. What is Portland’s Rose parade? 2. As is typical for many local Democrat and Republican party groups in parades across the country, the Multnomah County Republican Party was set to march as usual in this parade. What did two self-described “antifascist” groups threaten to do this year if the Republicans were allowed to march? 3. a) What additional threat was made against the parade through an anonymous email? Be specific. b) What reason did those behind the email give for their threat to “drag and push” law-abiding citizens out of the parade? c) Define espouse. Do you know any Republicans? Ask them if they espouse hatred toward these groups. 4. a) Before canceling the parade due to threats, what did the organizers ask the Republican group to do? b) What is your reaction to this request? and to the fact that the Republicans declined, but instead asked the police and mayor for protection? 5. The “antifascist” groups who organized protests over the parade due to the Republicans marching said they were not responsible for the threatening email. What do you think? 6. How did James Buchal, chairman of the Multnomah County Republican Party, explain his group’s belief that the parade should continue? How does he defend the MC Republicans? 7. What role do you think the Portland mayor and police department should have in ensuring the right of every citizen who had been approved to march in the parade to be able to do so safely? a) Is there a double-standard in Portland? If conservative protest groups opposed a Democratic Party group marching in the parade because they disagreed with their point of view on issues and called for protests against them, would the result have been the same? Explain your answer. b) How should university officials and police and local government officials respond when protesters shut down a talk or threaten marchers in a parade? 9. Fascism is defined as: a political system based on a very powerful leader, state control of social and economic life, and extreme pride in country and race, with no expression of political disagreement allowed (Cambridge Dictionary). Why do you think the progressives and anarchists, who forcefully shut down any speech or group they oppose, call those they oppose fascists?